These are sprung with open frames where appropriate using a sandwich arrangement to replicate the construction of the real thing. Brake vees are included to make life easier as are fixing points for the clasp brake hangers and tie bars. Spring wire is included. Wheels and bearings will be required to complete. Some modifications may be necessary to the underframe if building in EM and OO especially the LMS chassis kits due to the use of 3’7” wheels. I would recomend the appropraite detailing etch A.09 or A.11 to go with the chassis. They contain replacement clasp brakes which are designed locate acurately and easily on the chassis and in the case of the LMS examples tailored tie bars. The parts included in the David Geen kit can be used but they will require modification to fit. If building in OO then the appropriate yolks supplied in the David Geen kit will need to be used as the ones on my etch are P4/EM only. It may not be possible to use exact scale EM or OO wheels in the LMS chassis due to clearance issues with the flanges. Any wheels with diameter over flanges of no more than 15.2mm will be fine though. For the vast majority of milk tanks built at Swindon for the GWR and BR (WR). Will suit both Dean-Churchward and lever brakegear. For diagrams O.41, O.50, O.53 and O.58. These were built principally for twin tank/twin compartment vehicles. An extra pair of solebars will be required provide the extra length. For diagrams D.1991, D.1993 and most of D.1994. For some of the later diagram D.1994 vehicles as well as D.2173 and D.2174. The LMS changed the arrangement of the longitudinal beams used on the chassis (see above pictures). This is the only difference between the chassis and was in line with the change in RCH recommendations on the subject. The change took place at some point in the 1940s. The last batch of D.1994 (lot 1434) certainly had the later arrangement and there may have been others. Chassis certainly got swapped around over time and this seemed to be most prevalent in the 1970s when Swindon seemed to take a mix and match approach to the milk tank stock operating on the Western Region. I don’t know how common it was before then as photographic evidence is patchy but I’d be surprised if it didn’t happen. Check your prototype! 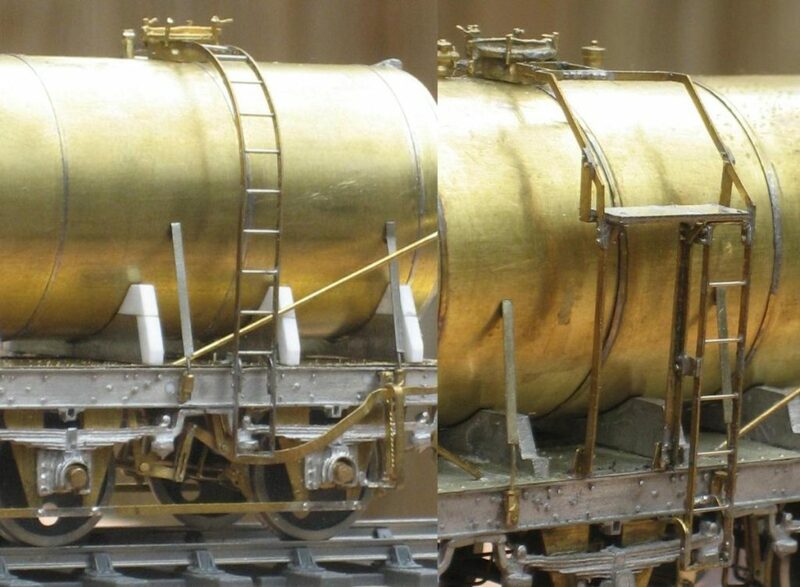 GWR O.58 Milk Tank. David Geen GWR milk tank kit, Rumney Models chassis A.02; lever brakegear, tie bars, brake shoes and standard ladder from A.09; twin tank long ladder from A.10 & tank formers from A.12. I have tried to cover as many of the variations that I have come across as possible. There is a caveat to that statement. My interests, and so the reason these etches exist, centre on the traffic emanating from South Wales in the mid Sixties and so that means I have concentrated on Unigate and Milk Marketing Board vehicles. There are some items such as meshed walkways that seemed to be most common on Express Dairies vehicles which are not covered. 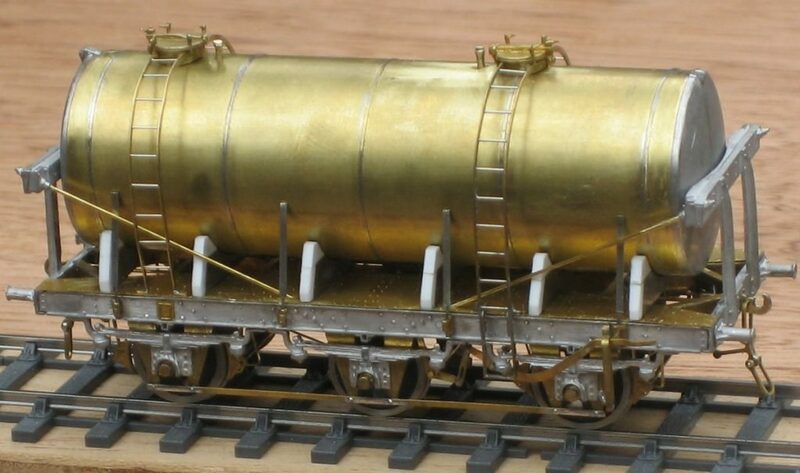 Hubert Carr of Model Railway Developments has talked about doing these and also does etched tank fixing straps for detailing RTR milk tanks. Makes up a pair of the distinctive platforms fitted to United Dairies GWR Diagram O.39, O.51, O.57 and O.60 and SR diagram 3155 and 3157 milk tanks. These replicate the prototype in close detail and as such are a bit of a fiddle to make up. They look great when done though! Alternative fixing brackets for the GWR and SR vehicles are included. There are three platforms on the etch, two right handed (the ladder of the right hand side as you look at it) and one left handed. The left handed version is just a mirror image of the right handed one. Almost all vehicles fitted with platform in the centre had right handed versions on both sides. The GWR O.57 and O.60 vehicles that had platforms fitted at one end had one right and one left handed version with the ladders towards the centre of the vehicle. Designed to enable you to actually build the above. I wouldn’t like to attempt to build the platforms with out one. Only one is required and can be reused as many times as you like. GWR Milk Tank detailing. GWR lever brakegear, tie bars and brake shoes from A.09 & twin tank long ladder from A.10 (left). United Dairies GWR/SR milk tank platform A.07 (right). GWR lever brakes, lifting links, vees and guards; rounder profile standard ladders; clasp brakes and yolks; tie bars. Sufficient for 2 vehicles. One pair of long ladders as fitted to twin tank wagons, one pair of partial platforms as fitted to diagram O.53 vehicles, one pair of partial platforms as fitted to diagram O.61 vehicles and several different sizes of fold up ‘planked’ walkways (there was meshed variety but this is not covered). There are sufficient walkways for one of each of the following diagrams: O.55, O.58, O.64 and O.65. Two sets of tie bars specifically designed to fit my chassis kits; three pairs of rounder profile ladders all with different fixing arrangements; brake lever guards and brackets to replace those in the David Geen kit; clasp brakes and yolks. 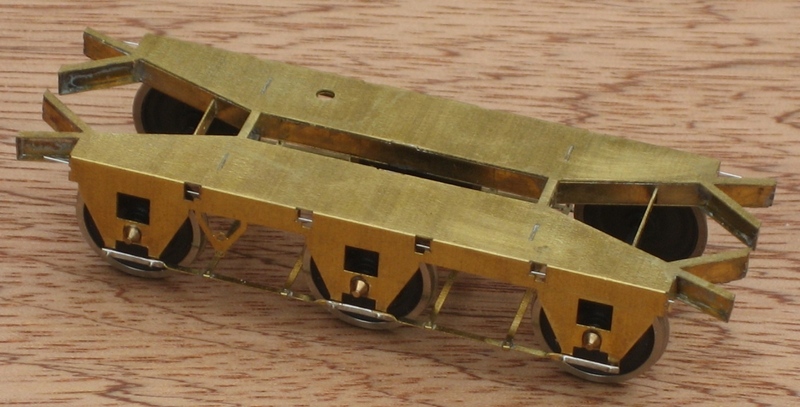 Also includes a pair of GWR type ‘planked’ walkways as fitted to some M.M.B. diagram D.1994 vehicles. Sufficient for 2 vehicles. One pair of formers for each of the following: GWR diagram O.53, GWR diagram O.58, LMS diagrams D.1991 and D.1993, 6’1” diameter unlagged tanks. Most milk tanks were of a similar size (6’1” diameter) but not all. This etch includes formers to enable different sizes of milk tanks to be constructed using 0.005” sheet. Also included are different tank lifting brackets.